Three days later with the rest of the class off sick I would be bouncing around like Bugs Bunny on speed wondering why there were only six of us in class that day. Nobody knows why having a cold makes a person feel like crap..it just does. I have a cold right now, but nobody believes me. Sniff. Colds affect everyone differently. In my case I wake up feeling bad, I ache from head to foot, alternate between sweating and shivering and I feel exhausted. What I don’t generally do is cough, sneeze and splutter all over the place. This in itself causes me to have the problem of no one believing I am sick. It’s always been the same, as a kid I would get packed off to school, because I didn’t look like I had a cold. I would sit there, totally miserable, spreading my germs to all and sundry all the time dreaming of my nice warm bed and wanting my muscles to stop hurting. Three days later with the rest of the class off sick I would be bouncing around like Bugs Bunny on speed wondering why there were only six of us in class that day. Everyone has a different immune system, and this is why people react so differently to the common cold, and illness in general. Once every so often, I will get a ‘real’ cold, one that everyone recognises as a cold, this happens once every couple of years.. Twice in my life I have had the flu (not bad for five decades and rising). I have to be fair and say that then people notice, I get a modicum of sympathy and the “Liz you look dreadful’ comments, which being so near to death in my suffering I sniff at and wonder if I am really starting to show my age. So today, as husband got up to go to work he re-iterated the stuff on my to-do list, drive to his mothers to collect something…I’ve forgotten what, go off the island to a meeting with building control regarding the extension, pick up dry cleaning…there’s a few other things, but my mind is blank at this point. I want to do the school run, come home and sleep, but I can’t, and it’s this situation that causes epidemics and even worse pandemics of disease. On this more serious note it has to be said that so many illnesses start off with aching muscles and fatigue, sore throats and a bit of a fever that often it’s difficult to tell if it’s a cold coming on or something far more serious. The pressure that is put on those people who do have jobs to get on with it, take no time off and be in work regardless of how they feel will one day not only be the death of them but of many others. The current outbreak of Ebola is a prime example of a very serious disease that starts with symptoms of the common cold/flu. There are many, many more. It is frowned upon to take time off, people are afraid to be ill, they know that there are dozens of would be replacements if they can’t ‘cut it’. In the long term this is entirely disadvantageous. Okay the reports for today will be dealt with, the clients wined and dined but that will be no help at all if they leave the restaurant carrying a fatal disease back to their families and colleagues. Even if employees aren’t carrying bubonic plague or some other nasty it would pay employers to be a little more sympathetic. 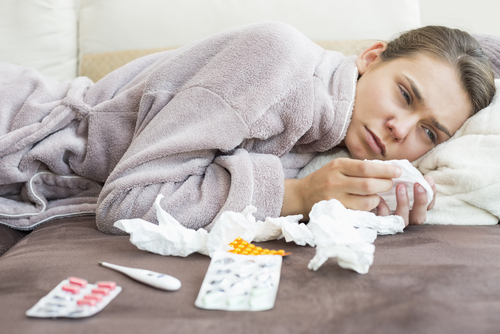 One employee with a cold, or influenza staying home can prevent it spreading through the company and actually prevent the decline in productivity that occurs every winter through this simple but highly contagious condition. That said it’s almost time to do the school run. Then I’m off to the Borough Council to discuss the building works, permission for which will be delayed because half the staff will be off sick next week. I could refuse to go of course, but as nobody believes I am sick…. Thinking about it, it’s time to practice what I preach, I’m going back to bed after the school run, we will get the building regs through far quicker in the long run.